Whenever I see one of those old visual prompts on Sepia Saturday, I know exactly where to go; I grab a cup of coffee and head up the stairs to the boxes of family memorabilia I’ve tucked away in a closet up there. …and my grandfather’s very first photo album! It’s about 5”x7” and has gray paper pages gathered and sewn in signatures of five inside a black leather cover. The paper label in the back says “Ward’s Flexible Albums,” but there’s not a hint as to when or where it was manufactured; my best guess is Boston, but I am not certain. Inside, there are shots of my grandfather and his younger brothers (Richard, Allen, Prescott, Howard) and his sister (Margaret). They’re summertime shots, mostly, taken in East Boothbay, Maine, where the family spent July and August out of the city heat in the early 1900s. These are two of my favorites: my grandfather (Gardner) is standing on the rocks and one of his brothers (Allen, I think) is twisting on the board (and that board looks like a situation of child endangerment to me); another is in the water, but I don’t know which one. But look at the bathing suits! My grandfather told me once that his bathing suit was the most uncomfortable thing he ever wore—said it was made partly of wool, and when it got wet, it itched like fury! Ten or so years ago, I inherited a scrapbook from my mother. She had compiled it in the 1930s when she lived with her parents and sister in the Boston area. The whole family loved the theatre (not “theater,” mind you…); they went often, and my mother pasted programs and flyers into her scrapbook faithfully—a perfect historical record. …you went to the theatre, you went out for a drink and/or a bite to eat afterwards. That’s just what you did. One of my mother’s favorite places to go after a performance was the Hotel Touraine, a residential hotel on the corner of Tremont and Boylston Streets in the theater district of Boston—a big brick and limestone building with a café and bar. The Café Royal had luncheon plates for 55 cents; dinners cost 75 cents, and were served from 5 until closing. The Touraine also had (according to this flyer) “the most beautiful cocktail bar in Boston,” although in November of 1936, my mother was barely seventeen years old, so I doubt she was cruising the tables. One of her possessions was a coffee server from the Hotel Touraine…I have no idea how she got it (I can’t, in my wildest moments, believe she actually might have stolen it). It’s heavy silverplate; it has “Hotel Touraine” and a manufacturing number stamped on the bottom. I keep it in my dining room, polish it faithfully. I have a collection of canes and umbrellas packed into a ceramic stand; it’s nestled in the corner of my living room, tucked up near the front door. There’s my father’s old cane—a rubber-tipped number he used for security as he got older; my great-aunt’s hiking cane (she scrambled all over Switzerland with it in the 1920s! ); there’s even the cane I used for a month or so after my hip replacement nearly five years ago. And there’s the two umbrellas (“umbies,” my parents called them! ): my father’s somber black, and my mother’s playful light-green one—it’s covered with frogs in various shades of green, brown and rust! Umbrella (Latin root “umbra” for “shade”). The first recorded use of umbrellas was about 3,500 years ago in Egypt, where umbrellas were used for protection from the sun (so the name makes perfect sense here). They were nothing fancy; think palm leaves stuck to a stick and fanned out for maximum coverage! Later on, the Chinese (who made multi-tiered paper umbrellas to help identify members of a multi-tiered society) figured out how to apply wax to the paper umbrella—and then it shed rainwater! For little rainstorms, I assume. And, oh! A scarf to match your umbrella (on right)…for another $2.10, please! When I was sifting through old photographs the other day, I was struck by the fact that I’ve got a lot of photos of children: children in sets and clusters of two, three, four and more; children sitting on front steps, at picnic tables; boys in pup tents, wearing scout uniforms; girls in rowboats wearing little white blouses and camp kerchiefs; boys AND girls posed next to their bicycles. Most of those children grew up to be my grandparents or my great aunts and uncles; two of them grew up to become my parents; seven are first cousins…one of those children grew up to be me! This is a photo of my mother and my aunt in the front walkway of my grandparents’ first house on Kirk Street in Boston; Martha (left) and Hope Howell (my mother is the younger). I asked her once about the date. She remembered clearly the trellis for the roses, the wooden steps, the big rhododendron; she remembered being told to hold Hope’s hand in a gesture of sibling companionship. I found it in a flea market, tucked away in a broken-down cardboard box that was shoved halfway beneath a display table. What caught my eye was a corner of an old newspaper—and I’ve always been a newsprint fan—so I pulled the box out into the aisle, sat down on the floor and went through every magazine, newspaper, booklet, and folded broadside inside. I found this on the very bottom, the last piece of ephemera in the stack. Miraculously, it was not distressed; there were no folds, no rips, no smears or smudges—kept flat and safe for years at the bottom of this old cardboard box. I recognized Gregorian Chant notation: four clef lines, single note (punctum), two stacked notes (podatus); although I had no idea what any of it meant (my high school Latin long gone, long gone…). I fell in love with it…bought it on the spot. I had it matted, framed; it now hangs in my study. I’ve always thought that one of the most powerful moments in human history must have been when two (or more) people realized they could sing together—sing as one rather than independently; they must have found the sense of unification and community that still draws us together today. I’ve always loved this painting. It was in my grandfather’s house; my father remembered it hanging in his bedroom when he was growing up. At some point, my father inherited it from his parents, and I from him. It’s on the west wall of my guest bedroom; the light yellow walls pick up the soft greens and yellows and browns of the grasses and fall leaves; the mountains rise high in the background—strong gray and blue under a pale sky. I’m pretty sure it’s someplace in New Hampshire—the mountains look right to me (for those of you who don’t know, the mountains in New Hampshire have a particular shape and heft, a sense of self that’s unmistakable). 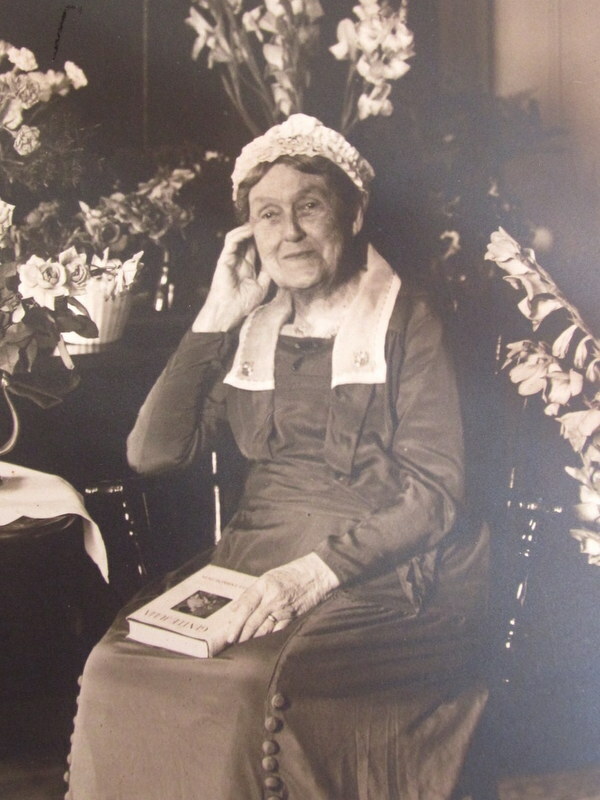 Elizabeth Della Richardson was born in (English) Canada in 1887; by 1910, she was a naturalized citizen, married to my great-great uncle Melvin W. Gould, Jr. living in Manchester, NH, first in a rented house, but soon in a house they owned on Maple Street. Elizabeth’s mother, a widow, lived with them. And while “at home,” she painted. Found this photo the other day; it took me by surprise! Look at all those shells! It must have been the 1960s – in my hippie days, when Vietnam was raging, the civil rights movement was on the rise, and I was idealistic enough to believe that my generation could put an end to all that horrific injustice and inequality by embracing values of love and peace, of inclusiveness and acceptance. A peace sign (for those of you not old enough to remember that symbol). I had a pair of Peace earrings that I wore occasionally – they were too heavy to wear every day; I gave an old boyfriend a silver Peace medallion – he wore it around his neck on a silver chain; when I was living on the farm, we had a Jersey cow so sweet and gentle that we riveted a leather Peace sign to her collar – when she died, we nailed it (collar and all) to a maple in the eastern tree line where she used to stand in the shade on hot summer days. As I said, I was idealistic then. I’m older now, a shade wiser, and I understand that everything I have fought for in the last fifty years is on very shaky ground. I am struggling to maintain my balance in a country I cannot recognize as my own, a country where the ideals of equality, justice, and working for the common good have been abandoned to sustain the financial and personal gain of the very few. It’s an empty place, an empty shell. There are bookcases in my living room—an upper level of five shelves that go up to the ceiling stacked over a lower level of countertop with shelves underneath. The bottom section has matching latticed doors that I keep shuttered at all times because it’s always incredibly messy in there. Every so often, I open the doors and clean things up. I sort through photos, jigsaw puzzles, board games, old packs of cards, books that are too big to stack on the upper shelves, old records, etc. I pack things to donate to charity, shove others in trash bags to hit the curb on collection day; I also end up putting things back into the cupboards—things I’m just not ready to part with yet. I stumbled across my 1966 college yearbook the other day. I poured a cup of coffee and thumbed through: page after page of young women who looked remarkably alike…page boy hairstyles, knee-high socks, plaid skirts, wool sweaters, Peter Pan collars and the occasional turtleneck. We weren’t quite “Barbies,” but it was mighty close! Anyway, as I was looking through the photos, I noticed that the school photographer had taken all our class group photos on stairways—page after page of sequences of young women posed (alphabetically, by surname; we’re of so little importance that we don’t even have first names) on stairways, one after the other, all lined up like little Stepford Wives, hands on the railing. The caption reads: D. Gould, W. Gillingham, E. Grant, L. Goldey, D. Gannet, N. Glesmann, K. Gardner, C. Givens. And there I am, at twenty years old, standing on the bottom step. He joined the Navy in 1940 with dreams of becoming a pilot; he had his flight training in Jacksonville, Florida. After successfully completing flight school, he flew transport planes for the US Navy during the war, hopping between Miami and Rio every few days. Before he married my mother, he lived in a small house in Miami with three other US Navy pilots and a chimpanzee named Violet (she’s a whole different story), a charismatic group of flyboys who spent their evenings in the bars and nightclubs of Miami, slamming down drinks, appreciating the women and listening to jazz and swing bands that toured the area…Basie, Goodman, Dorsey, etc. And then along came Ella Fitzgerald. The first time he heard her sing, my father was transported. He spent an entire night at a little table in a nightclub, smoking Chesterfields, sipping Manhattans and listening to a voice that left him speechless. When she took a break between sets, my father (emboldened, I’m sure, by the alcohol), approached her, asked if he could buy her a drink. He never could remember what she had to drink; he remembered her eyes and her laugh and her voice. I’m fascinated by seeing photographs of people as they grow, as they mature; there’s something magical about this aging process. 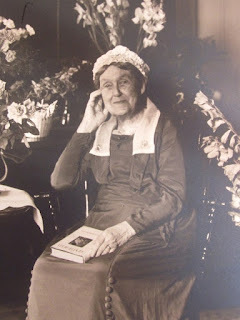 Here’s two photographs of my great-great grandmother, Roxanna Adams Wilder Sabin, 1832-1926. The first shot is Roxanna at 1850 or so, just before her marriage; the second was taken at Newton Upper Falls, Massachusetts, shortly before she died in 1926. When Roxanna’s mother died, she and her siblings were taken in by relatives (a common practice back in the early 1800s). Roxanna was placed with childless aunt who was, unfortunately, married to a man who wasn’t particularly fond of children; he eventually tired of the situation and took her to the Poor Farm and left her there. The entire community was outraged. A man named Prescott Wilder rescued her from the Poor Farm, took her home; he and his wife raised her. She grew up as Roxanna Wilder, even though Prescott Wilder never officially adopted her. 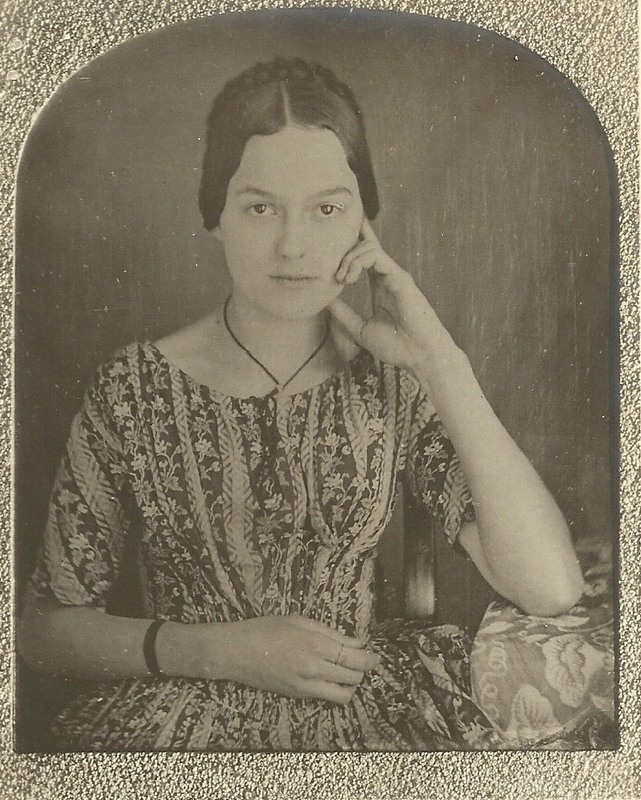 Roxanna married Lucius Sabin in 1851. They lived in Ashburnham and Gardner, Massachusetts; they had four children: Lucius (Lute) Wilder Sabin, Frances Taylor Sabin (my paternal great-grandmother), Edwin Alonzo Sabin and Ethel Wheeler Sabin. One of the things I love about these two photographs is the pose -- hand to the cheek, etc. I wonder if it was intentional? To see what other people have found to match this young/old theme, visit Sepia Saturday, a blog that calls for others "to share their history through the medium of photographs."